It remains hot and sunny in Buseesa, Uganda. The rainy season was supposed to start two weeks ago but other than one major thunderstorm there has been little rain. We are wrapping up details on the two projects. I haven't seen Erin and Jim since breakfast. Among the many tasks they planned today were: a meeting with Father Godfrey to thank him for his help the past two weeks; a meeting with the Buseesa B community to discuss potential future projects; and a diagnostic test of the well's flow rate. Meanwhile John (that wouild be me) was busy with QEnergy staking out where to place the fence around the digester to keep the goats out. The neceessary posts are in hand as is the barbed wire. Jonan, the farm manager, went to Akasalaba to hire some men to build it tomorrow. QEnergy, several sisters and I agreed to a plan as to where to place the large and small stoves/burners in the kitchen. Those will start to be installed when QEnergy returns to the school in a few weeks. Meanwhile the cow manure in the digester will ferment and create biogas. We also agreed to the schedule for all remaining ancillary construction and the training of farm hands and cooks. That will be accomplished over the next two months. QEnergy is a small organization but impressive. I feel very confident they will follow through on their commitments. The Sister's are in good hands in our absence. Tomorrow morning we depart for Kampala (4-hour drive) for a stop at the craft market for souveniers, then a change of clothes at the Sister's facility in Mpala before the short drive to the Entebbe airport for our 11:30 pm flight to Amsterdam. From there it is on to Detroit, arriving back in Cincinnati mid-afternoon Sunday. We are all looking forward to getting home after this successful implementation trip. This will be our last post to this blog. This provides an update on the water and biogas projects. Posting to this blog have not been forthcoming because the internet was down for several days due to thunderstorm damage to the provider's equipment. The water project is complete. The second hole drilled had a very acceptable flow rate (about 20 L./min. ), so the pump was installed and chlorine was added a few days ago to sanitize it. In the next day or so the chlorine will be pumped out and the well will be available for community use. A very successful project. With the well done and the biogas contractor back in Kampala for a few days rest, our team took a few days off to head north to Murchinson National Park to see the falls on the Nile River plus do a game drive throug the park in an open vehicle. The park is massive. We stayed in Gulu and got up at 3 a.m. to drive to the park, getting there when the gates opened at 7 a.m. The early arrival gave us a shot at seeing more game and we were rewarded with spotting several lions within 150 feet. Our guide said we were very lucky as he hadn't seen any in the last 3 months. We also saw many water buffalo, elephants, warthogs, giraffes, hippos and much more. A great experience. Our transportation to Gulu was the well-driller's pickup truck. It was loaded in back with the drilling equipment, 6 men from the drilling crew, a motorcycle and Jim. The 14-hour trip was over very bad dirt roads. Along the way it rained a few times so the men covered themselves with a tarp but still got wet. Erin and I were fortunate to ride in the cab; Jim said we missed out on the comradierie. 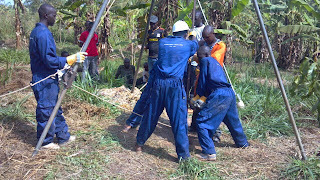 The biogas project is going well. The mixing tank, digester trench with walls, effluent tank and roof are complete. The bag has been laid out in the trench and cow manure/water is being added today. The gas line to the kitchen is also being installed. Tomorrow we will fence off the area with barbed wire to keep the goats away. Then the unit will sit for 2-3 weeks while the mixture ferments and creates biogas. 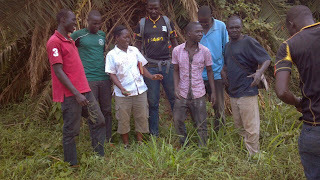 At that time QEnergy will return to teach the farm hands how to feed the digester with pig, chicken and goat manure. They will also install the burners in the kitchen then and teach the cooks how to use them. Overall, we are very tired, very dirty and very satisfied that both projects are doing so nicely. The email capability has gone down for several days at the school in Buseesa, so only limited information has been sent via text message. The first part of the digester work is completed, which includes digging the main trench, bricking the sides, and installing the roof, mixing tank, and effluent tank. The QEnergy crew is taking a break and will return on Tuesday to install the bag itself, make the remaining connections, and run piping to the kitchen. John is impressed with the quality of work done by QEnergy, their hard work, and their responsiveness to suggestions. He is busy making lots of dimensioned sketches and taking lots of photos to record the as-built project. The travel team is also taking a couple of days off, to be tourists, and are scheduled to go on a safari in Gulu. Yesterday (Wednesday) was quite warm and sunny--- high 80's ---but we had a thunderstorm late in the afternoon that cooled it off a bit. 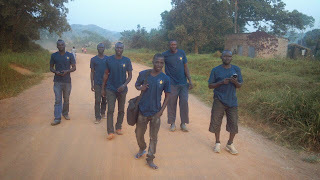 As usual, we walked the mile-or-so dirt/mud rutted road to Akasalaba to have dinner with the Young Men Drillers and QEnergy crews. A cook has been hired there to feed all of us this week. Michael and Tusabe, from the BCDC, gave us rides back to the school on their motorcycles. They and other motorcyclists in Uganda handle their bikes with a high level of agility. Very impressive. Erin and Jim have been spending nearly all their time at the well site in Akasalaba with the Young Men Drillers crew. They stopped drilling the second hole at 13 meters, installed a casing and are now developing that well. Apparently the flow rate in the second hole is meeting expectations better than than the first hole. John has been spending his time at the biogas digester construction site at the school with QEnergy. The main 15-meter trench is complete and the sides and ends are now being beveled. That work should be done early tomorrow. The brick effluent tank was also started and is half complete. Tomorrow they will start bricking in the short walls that run along both sides of the 15-meter long hole. They will also start digging post holes to support the corrugated roof. We are on track to install the bag next Tuesday and fill it with a truck-load of cow manure being sourced from Mubende, an hours drive from here. Here's a new learning: Umar, the crew chief, said that someone will need to get inside the 1.5 meter diameter by 1 meter high input tank when goat manure pellets are being added. He said the pellets need to be squished (he bent down and made a motjon of doing this with his hands) before water is added. Apparently if the pellets don't get squished they don't decompose very well on their way through the digester bag. We engineers need to find a simple solution to this task to make it less objectionable and more sanitary.